One) Keep an open mind. If you are a person who is afraid of nature — of spiders, snakes, bats, bugs of all kinds — I would love it if something you read here eased that fear. I would love to convince you to please just give wild creatures a chance. Learn a few facts about the one(s) you are afraid of, go to a zoo and touch the animals at the educational tables. 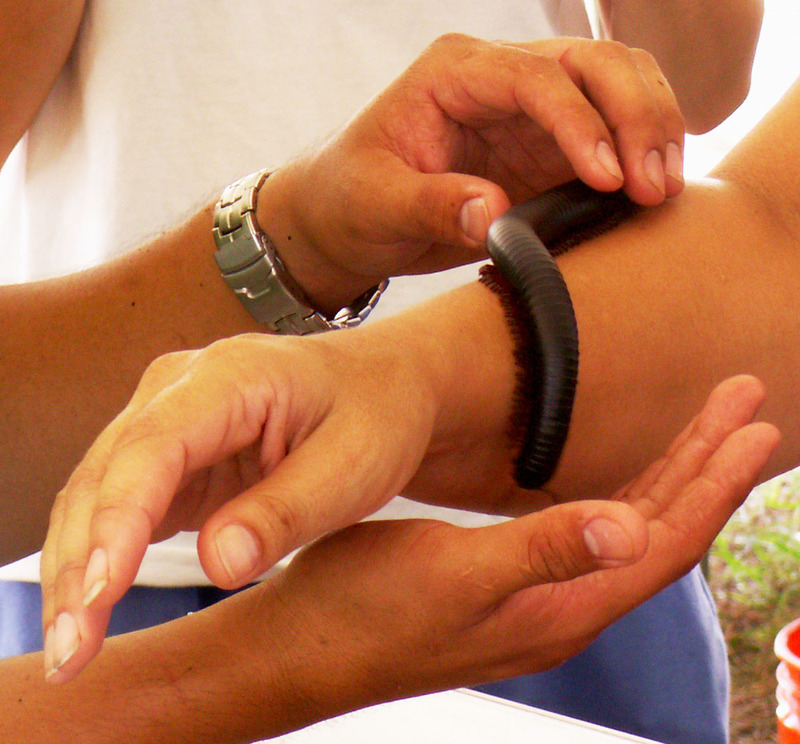 A big millipede. Its legs felt like tiny plastic bristles on a scrub brush. It tickled. Whether you are someone who has never really thought much about the nature around us, or someone who is overwhelmed thinking of the huge coordinated effort that conservation projects take, I would love it if something you read here convinced you that even small actions can build good results. A post that communicates this idea beautifully is by Deniz Ortac on Geetha Ortac’s blog Conservation for the Wild. Just do what you can in the tiniest of ways. Leave the “weeds” in one corner of your yard, leave a dead plant stalk on your apartment balcony, maybe do a little “guerrilla gardening” in a neglected area. Your life will be enriched by species you never noticed before, and the mini-habitats will help them survive. Leave a few weeds where you can, and you will be surprised at the treasures that show up. One person’s weed is another creature’s host plant. 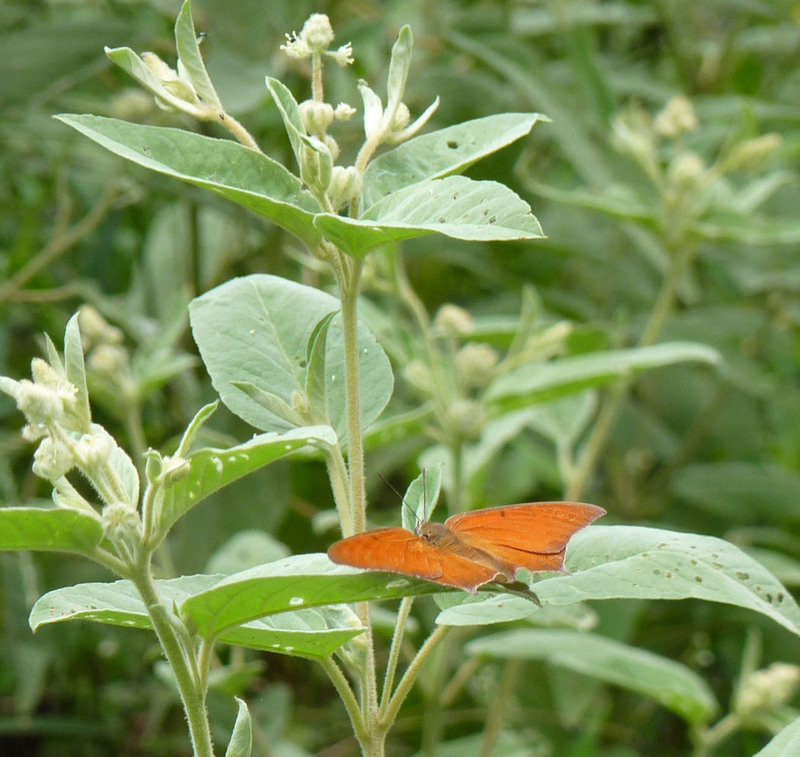 This is goatweed (croton) and a Goatweed Leafwing butterfly. And finally, if you know advocacy is important, but you need so much solitude, and are so conflict-averse that you leave all the activism to those who must get an adrenaline kick from that sort of thing, engaging with other people and all that, because they are just so tireless about it, and you have stayed out of every political discussion for the last 50 years because after all you have better things to do — oh wait, this one’s for me. I actually ended up at some town meetings this year, and at one of them, our local tax appraiser said that every Monday, he writes to all his elected representatives, telling them what he thinks, good or bad, of the announcements and votes they made the previous week. Ever since, I have been thinking that that’s great, and every citizen should do something like that, but the ones that seem extremely under-represented to me are those who can’t speak for themselves. Who reminds those officials to consider each and every plant and animal that their decisions will impact? The big famous conservation groups are trying to save big famous species; they can’t get detailed about every species of wildlife in each district. So that was a big reason I started this blog — to track all the species I can find in this small spot, to show the diversity I treasure, to learn more about all these creatures myself. Just trying to build knowledge for the “someday” I would write to officials about the nature in their district has caused me to look longer and more often, to research and record data . But I can’t hope and expect to change other people’s interactions with nature, without being willing to change myself. So today I finally looked up all my elected officials, and I am committing (God willing and the creek don’t rise) to write to them once a month, to remind them to please consider all of us in their decisions. I don’t have the answers for all the issues they face, I don’t even know all the factors they have to take into account as they legislate. But I know who I represent, and I can remind them to please remember the rich varieties of life that their districts contain. I would love it if this planted some seeds, if it became second nature for officials to always consider the future of all of their diverse constituents. Is that a nutria between the snake and the grasshopper in your pictures? Those things are too much like Rodents of Unusual Size for my comfort. They’ve always freaked me out. Now groundhogs, which I guess are the nutria of the north (in that they are large and brown and go about their business as if oblivious to us), are adorable. I see them surprisingly often around the train tracks by campus, and they make me laugh every time. My goldfinches haven’t come around in a few weeks (I suppose because lots of native flowers have gone to seed and are tastier than nyjer?) but I put out a suet block and a hummingbird feeder just in case, and left the nyjer sock – we’ve got lots of migrators going through right now, especially warblers, which apparently like suet and nectar. Next year I want to actually have a native plant container garden on the deck. It’s a tiny drop in this heavily cemented region, but it’s my little effort. No, it is a beaver! During the drought in 2011, one showed up. In August we noticed the trees it brought down, and we could hear it chewing at night, but we never saw it until the day I got those pictures in January of 2012, after the rain had started again. And after that day it apparently went on its way! Maybe your goldfinches are headed south. It will be interesting to see what you get this winter once the birds learn you have stuff for them! You made your case so well here! Brilliant ideas. Good luck with presenting them to your elected officials. I think if we all just did a little bit to help our local wildlife the world would be a much better place. It’s important to educate children too… once they know and love their local critters they will still love them when they are adults. 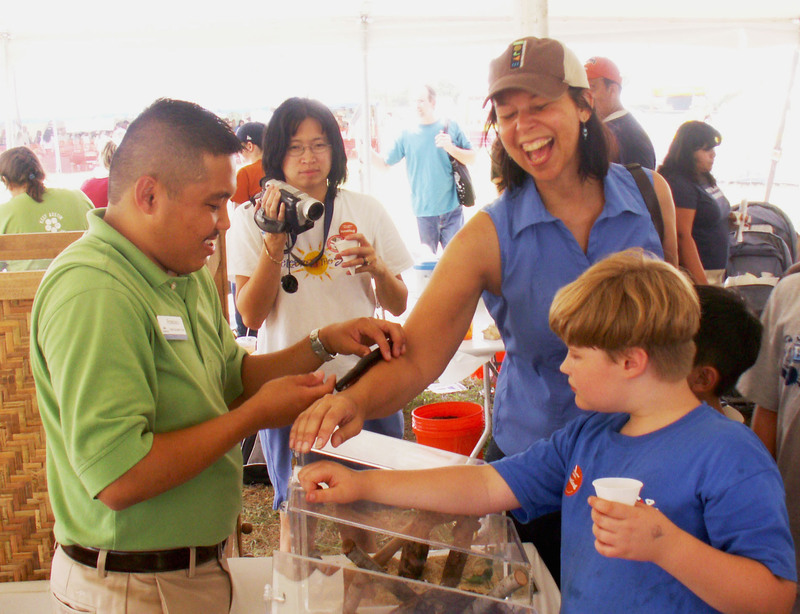 Yes, I do a lot of outreach (with volunteer groups) to both adults and children – that part comes very naturally to me. Contacting officials, not so much. But I think I need to challenge myself to do that part too. I never thought about it the other way though – maybe some people who thrive on reminding officials of their ideas, have a hard time interacting with children. 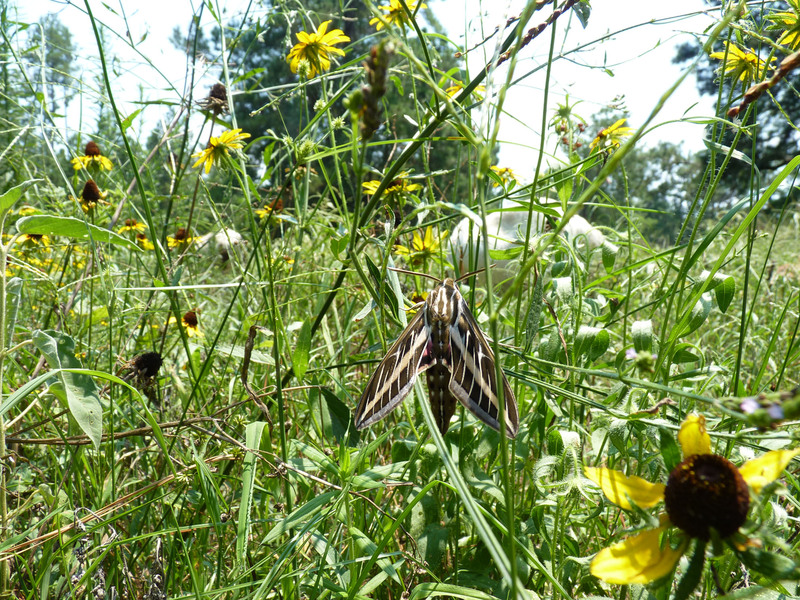 I may be helping achieve our mutual conservation goals in a way that would be hard for them!